Most recently, you may have seen Barkley and I together at a workshop you attended. He travels with me quite often when I’m conducting trauma resolution trainings and is available to provide comfort when something ‘comes up’ for someone. Dogs are so intuitive and are real pros at being present; something we can all learn from. 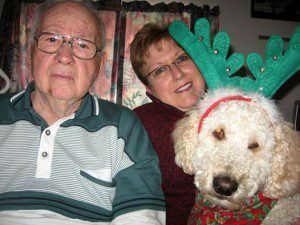 Over the years, the dogs and I have visited homes, elementary schools, middle schools, high schools, college campuses, libraries, hospitals, nursing homes and funeral homes. We have visited hospice families upon request and been ‘on call’ for organizations in crisis. We have attended visiting hours and funerals and made trips to schools following the death of staff and students. We have given annual presentations on bite prevention, dog care and training at the Annual Healthy Kids Day at our local YMCA. We’ve attended church and community groups and walked in parades. We’ve gone to school for ‘fun days’ and to ease the stress during exam week. Russell & Cynthia Scott with their four Certified Therapy Dogs in 2010. Golden Retrievers, Franklin and Hannahbelle, certified in 2006. 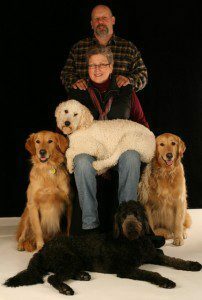 Golden Doodles, Barkley and EmmaJean, certified in 2011. Betty loves Hannahbelle and Hannahbelle loves Betty! Once someone has loved and lost a Golden, it means so much to have a Golden Visitor. Therapy Dogs help people live a life with dignity and love. TDI dog teams aid in the healing process by providing emotional wellness and ultimately, making a difference in the lives of others. Barkley and I visited my Dad at Sandy River Nursing Care Center in Farmington two weeks after his stroke. This was Barkley’s first Therapy Dog visit after becoming certified in November 2011. He did a great job and everyone loved seeing him! Residents look forward to the arrival of the Therapy Dogs and to many, the visits are the highlight of their week. Often, the elderly are reminded of dogs that they’ve had in their past and the joyful memories are quite evident to everyone involved. As years go by, the elderly often experience feelings of loneliness and insecurity especially because they are not involved in as many activities as they were in the past. 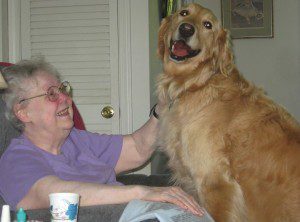 Therapy Dogs help to involve the elderly to live a happy, productive life by filling a need that is not being addressed in any other way. 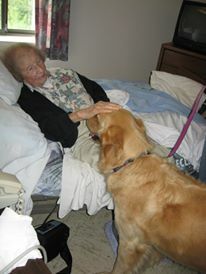 Residents often look forward to the dog’s visit and cherish the moments spent together. The main objective of this program is to provide a relaxed and “dog-friendly” atmosphere which allows students to practice the skill of reading. Many of the children chosen for this program have difficulties reading and, as a result, have developed self-esteem issues. They are often self-conscious when reading aloud in front of other classmates. By sitting down next to a dog and reading to the dog, all threats of being judged are put aside. 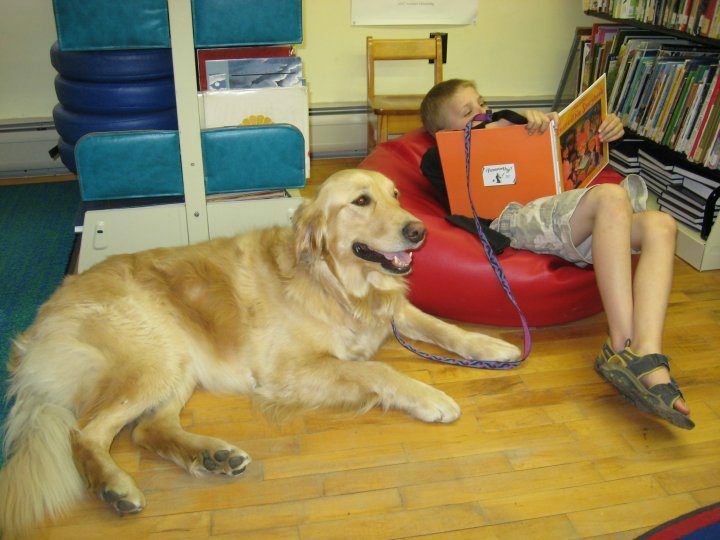 The child relaxes, pats the attentive dog, and focuses on the reading. Reading improves because the child is practicing the skill of reading, building self-esteem, and associating reading with something pleasant. 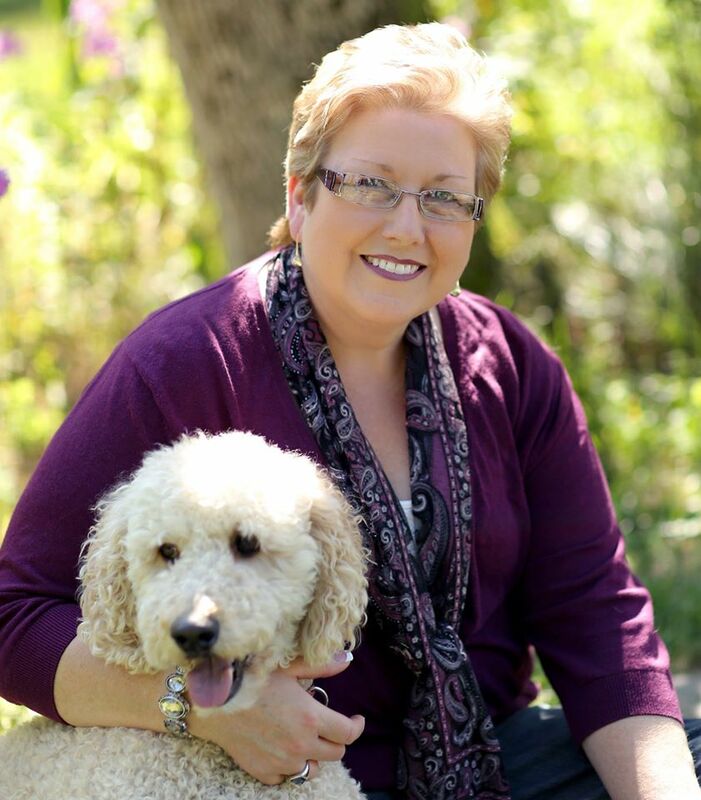 Dog Lovers and Trainers that they are, Cynthia and her husband, Russell, created Fresh Air Dogs (training, daycare and in-home lodging) in Guilford, Maine. They opened the doors on January 1, 2010 and in the 7+ years since, have only had 19 days with no dogs! Whew! Gotta love it!